My experience at UMBC has been life changing. The social work faculty and staff are so supportive and encouraging, and this has motivated me to work hard and try things that are out of my comfort zone. Coming to UMBC, Erin Callahan not only found a “sisterhood” of like-minded adult students, but also a pathway to help victims of trauma. Callahan is both a Returning Women Scholar and recipient of the Susan Bernstein-Charlotte W. Newcombe Memorial Scholarship. Through her involvement with UMBC’s Women’s Center and the social work program, she participated in events and discussions that helped shape her understanding of areas of need within the community. Having witnessed the effects of intergenerational trauma within her own circles, she hopes to study the root causes of trauma in order to help people early on. 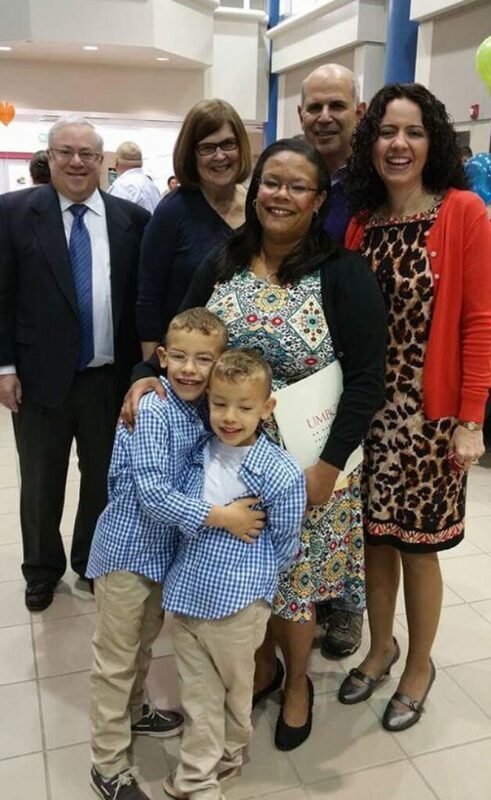 Erin Callahan poses with her two children, who she says have been her biggest inspiration to succeed during her time at UMBC; photo courtesy of Callahan. As a member of UMBC’s returning student population, Callahan found “a sisterhood of other adults experiencing similar struggles balancing the demands of life as adult students,” which helped her feel connected and offered her support when she needed it. She shares that her two children have continually served as her biggest inspiration to succeed in her time at UMBC. Callahan has been accepted to University of Maryland School of Social Work’s Advanced Standing Program, and will next complete her master’s degree in social work. Portrait by Marlayna Demond ’11 for UMBC.